We here at Pingdom have been talking about why we don’t see that many women in Open Source, and were actually about to investigate it further and possibly write a blog post about it. However, when we started to actually look around we were happily surprised. There are lots of women involved in Open Source! For some reason men just seem to stick their nose out more and put themselves in positions where they are seen (and of course there are more of them). That said, women do seem to be highly underrepresented in the Open Source community. A study from 2006, Flosspols report, indicates that about 1.5 % of the Open Source community is female compared to 28% in proprietary software. The Open Source community is large, though, so that 1.5% amounts to a fair share of women. There are several different groups and websites devoted to just women and Open Source such as: LinuxChix , Apache Women, BSDChix, Debian Women, Fedora Women, GNOME Women, KDE Women, Ubuntu Women, PHP Women and Drupalchix. This post is our contribution to the community to highlight some of the women in Open Source and to hopefully engage other women to join. Included in Time magazine’s annual list of the 100 most influential people in the world in 2005. 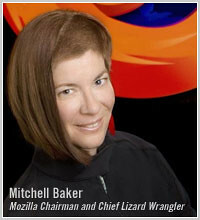 She is the Chairman of the Mozilla Foundation and Chairman and former CEO of Mozilla Corporation, the company that coordinates the development of Firefox and the Thunderbird email client. Danese Cooper is an advocate of open source software and sits on the board of the Open Source Initiative. Previously she has worked at Sun where she created and managed the Open Source Programs Office among other things. Kim Polese is the CEO of SpikeSource, a provider of business-ready Open Source solutions. Previously she has spent seven years with Sun working as a Java product manager, and also acted as the president and CEO of Marimba during the dot-com era. She was included in Time magazine’s list of “The 25 Most Influential Americans” in 1997. Margo Seltzer was the CTO of Sleepycat Software prior to the acquisition by Oracle in 2006. She was the lead author of the BSD-LFS paper and is a director of the USENIX association while continuing to serve as an architect on the Oracle Berkeley database team. Stormy Peters is a co-founder of the non-profit GNOME Foundation and frequently speaks about Open Source at major conferences. Stormy has also addressed the United Nations, the European Union and various U.S. state governments regarding Open Source software. Mena Trott is the president and co-founder of the company Six Apart, creators of Movable Type and TypePad. She was named one of the People of the Year by PC Magazine in 2004. Val Henson has worked at companies such as Intel, IBM and Sun. She is a specialist in file systems and was a key developer and architect for ZFS at Sun and is currently developing chunkfs, a new Linux file system. Máirín Duffy is a senior interaction designer with Red Hat and is the team lead of the Fedora art team. She is also involved in the GNOME project where she is working on the GNOME marketing team and has developed the GNOME brand book. Allison is the president of the Perl Foundation. She is a key figure in the Perl community and has been active in the Perl 6 design process since the start as a project manager as well as contributing code and design. Dru Lavigne, maintainer of the Open Protocol Resource, writer for the “FreeBSD Basics” column on ONLamp, and author of BSD Hacks and The Best of FreeBSD Basics books. Lynne Jolitz, an early BSD user and Open Source contributor and advocate. Machtelt Garrels, Linux veteran, member of the Linux Documentation Project and BSD Certification Group Advisory Board and founder of the OpenDoc Society. Pia Waugh, president of the organization that runs Software Freedom Day and the former president and vice-president of Linux Australia. Radia Perlman, a contributor to network security, strong password protocols, IPSEC among other things. Silicon Valley Inventor of the Year in 2004. Erinn Clark, a Debian developer as well as the leader and co-founder of Debian Women. Hanna Wallach, a GNOME and Debian developer who helped the GNOME foundation to get its Women’s Summer Outreach Program off the ground. Amaya Rodrigo Sastre, a Debian developer and co-founder of Debian Women, as well as conference organizer and evangelist. Celeste Lyn Paul, participating in the KDE usability project as well as a member of the HCI working group. She has worked on the KDE4 Human Interface Guidelines. Eva Brucherseifer, co-founder of KDE Women, the KDE Edu project and the KDE Solaris mailing list. This list is of course nowhere near complete and is based on mentions in articles, blogs, mailing lists, etc. A special thanks to ITtoolbox which had a blog post called Top 10 Girl Geeks in 2006 which acted as a starting point for this list. We hope that this post has helped highlight some of the women in Open Source, and the fact that there actually are lots of talented women working with Open Source even though they often act behind the scenes. You could have mentioned Anne Nicolas, head of engineering here at Mandriva, which means she is in overall charge of the technical development side of all Mandriva products. To my knowledge, she is the highest-placed female developer in any major Linux distribution. You missed Leah Culver! She colaborate with DJango project (Python framework) and she’s awesome beatiful!!! I think I found the problem: no one knows those are women. Mena Grabowski Trott. No idea. In only 3 cases do you know that its a woman. I just found out now that Mitchell Baker is not a man, therefore I cannot continue using a product which is doomed to fail. She did identd and ip_masqerading! Robbie – I hope that your attempt at humor was just that. On a serious note it is that attitude that women smile along with and then move on. I was the only female in my graduating class. The men in my class accused me of everything from cheating to hitting on them and more. Now, a few years out in the ‘real world’ I find that my educational experience doesn’t differ that much from the attitudes presented in the workplace. It is a sad state. If this was a different kind of bias – say, insufficient Muslims in the open source world (I have no idea if there are or aren’t) – it would be rightly considered irrelevant and offensive to make a song and dance about it. I don’t see why a sexual bias is any different. Free software communities, more than most, are largely meritocratic: contributors are measured according to what they do rather than who they are. Screaming “look, a woman who can code! We’d better make a top 10 / offer help and support” is a much more sexist attitude than any OSS project I’ve ever been involved in! I now use my full legal name professionally, Valerie Henson. While most people called me Val growing up, I made a conscious (and stupid) choice to go by Val professionally, exactly because I was afraid that if people knew I was female, they would automatically respect me less than a male with the same qualifications. So my original choice to go by a gender-neutral name was a good move professionally, after all. However, I want to change things for the better for all women, and that means making sure that people know I’m female instead of allowing them to assume I’m male. The pivotal moment for me was when I heard that some people at a conference were arguing about whether women could be Linux kernel maintainers – people that had accepted patches from me when I was a Linux kernel maintainer! I find it interesting that many of the women mentioned here are executives. Those that seem to have an involvement in development are often user-interface specialists or have been assigned to open source development by the companies that they work for. I have been working for some time to increase the number of women who major in computing in college. It is an uphill battle. I have found the literature on the topic less than helpful: everyone bemoans the lack of women, but no one seems to have found a proven way of attracting women to software development. I have noticed that there are very, very few women doing significant development of open source software who are self-selected, i.e., who are volunteers (hobbyists). This is despite the fact that the community of volunteer open-source developers is highly diverse in every other respect. Could it be that the reason for the general lack of women in software development is that women naturally find other things more interesting? I’m on this list and I majored in computer science; I am an interaction designer. There is a dire lack of designers in free & open source software. You seem to feel that design for user experience is not a ‘real’ part of software development. It is in fact a very important part of development that is sadly overlooked, not prioritized, and/or just not done in FOSS because designers in FOSS communities are so rare. I was attracted to study computer science because of the incredible things it makes possible, not for the love of doing it. Designing usable experiences makes those things much more accessible to a larger body of people and is more exciting, in my opinion. Perhaps the folks whose primary involvement is coding love the journey, while I prefer to focus on the destination. I know you did not say this explicitly but I get the sense from the overall tone of your post that you feel somehow programmers are more important than other contributors. Please don’t downplay the contributions of people in free & open source software just because they are not all programmers. It will take a whole lot more than code to make the free & open source community exceed its current grasp. While the focus on coders is certainly understandable, it should not take away from the contributions of people who do not write code whether they are male or female. There is a factual error in this. Allison Randal is President emeritus of the Perl Foundation. It’s been a couple years. However, she is very much involved and is on the Board of Directors of the Foundation. She’s also the architect of Parrot, a VM designed from the ground up to run dymanic languages (primary of which is Perl 6). Mena is smart, but I didn’t think MT was open source. It is a reproductive thing. Most women have no shortage of suitors. Men have to make a show (unless they have utterly fantastic bodies, and even then….). As for pea fowl, as for hackers; evolution does discriminate; reproduce or your genes die.